This post is part of a week of action by the Electronic Frontier Foundation and other organizations in January 2014, to which the Wikimedia Foundation is invited to contribute, particularly on Wednesday January 15, when the topic of action is Open Access. Open access is about freedom to read and to reuse research communications, including to remix, revise and redistribute them. Courtship song of a male Cotesia congregata wasp. 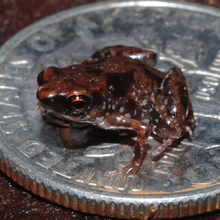 Paedophryne amauensis, the smallest known vertebrate. Wikipedia aims to collect the sum of human knowledge and is operating under five fundamental principles, also known as the “five pillars” – it is (1) an encyclopedia that can (2) be read, modified and shared by anyone, while it strives for (3) a neutral point of view and (4) civil discourse on the basis of respect within its community of contributors, which (5) can amend policies and guidelines. Writing with the aim of representing a topic neutrally requires access to quality sources of information. Citing these sources allows readers of the encyclopedia to verify statements made in its articles, and to explore the topic further, be it for themselves or to enrich future versions of the same or some related Wikipedia article. Existing copyright legislation makes it difficult to use sources in these ways. In the current default mode with “all rights reserved” articles hidden behind paywalls, Wikipedia authors are barred from reading the sources they might need to improve Wikipedia content, readers might be prevented from verifying the information they find in Wikipedia articles, or even whether it represents a copyright violation or plagiarism. In the event that they can eventually get read access to specific sources, they still do not have the right to use any materials from there (e.g. images, audio or video) to illustrate Wikipedia articles or blog posts about relevant topics. Over the years of exposure to this set of problems, the Wikimedia communities have come up with a number of approaches to handle the situation. Two of them shall be presented today in a pair of blog posts. The first one is about the Wikipedia Library, an effort to provide read access to the scholarly literature for active Wikipedia contributors. This second one is about interactions of the Wikimedia and Open Access communities, most notably via WikiProject Open Access, which places particular emphasis on reusing materials from suitably licensed scholarly publications in the context of Wikimedia projects. The Open Access movement and the Wikimedia community have interacted for more than ten years, particularly via the English Wikipedia. For instance, the article about arXiv was started on February 11, 2002, the entry on preprint followed ten months later. In November 2003, the entry open access publishing was started, which was renamed into open access two months later. Still in 2004, the first Wikimedia chapter — Wikimedia Germany was founded, which went on to become the first Wikimedia entity to sign the Berlin Declaration on Open Access to Knowledge in the Sciences and Humanities in 2006, followed by Wikimedia Poland and the Wikimedia Foundation a year later. Since that time, suggestions for large-scale import of materials from Open Access sources into Wikimedia platforms have kept coming up. In early 2007, the first images from Open Access sources were promoted to featured status on Wikimedia Commons, with one of them reaching the final of that year’s Picture of the Year contest (the 2013 contest is scheduled to start on Friday, again with an Open Access image). With the beginning of 2009, the journal RNA Biology (which was and still is not Open Access) started to require manuscripts about new RNA families to be accompanied by drafts for corresponding Wikipedia articles, and a few months later, WikiSpecies started a collaboration with the Open-Access journal ZooKeys that was expanded to its sister journal PhytoKeys in the following year. While more and more images from Open Access sources were uploaded and the number of references from Wikipedia to Open Access articles continued to grow, research about Wikipedia was still mainly published in closed-access journals. This prompted the newly established Research Committee to draft, in 2010, an Open Access policy for research projects receiving significant support from the Wikimedia Foundation. Since July 2011, the Research:Newsletter has marked references as to whether they were free to read or not. Later that year, Wikimedia Germany had approved funding for the Open Access Media Importer, an automated tool to harvest audio and video materials from suitably licensed scholarly articles and to upload them to Wikimedia Commons. Still in late 2011, the Open Access File of the Day initiative was started, and the Research Committee submitted a response to a EU consultation about Open Access, followed by a response to a similar consultation by the White House in January 2012, at a day when a tiny frog’s image from PLOS ONE was on the front page of more than a dozen Wikipedias. Two days before that, WikiProject Open Access had been launched. Since January 2012, an Open Access report has been published as part of the monthly GLAM newsletter. In March, PLOS Computational Biology started its Topic Pages — a manuscript track for review articles destined to become updatable as Wikipedia entries — with the article about Circular permutation in proteins. In May, Jimmy Wales became an advisor to the UK government on matters of Open Access, and the Wikimedia Foundation endorsed the Access2Research petition to the White House. In 2013, WikiProject Open Access organized a session at the CERN Workshop on Innovations in Scholarly Communication and an Open Access panel at Wikimania Hong Kong. The Open Access Media Importer won an Accelerating Science Award, and Open Access was announced as one of the core themes for Wikimania 2014 in London. As of today, WikiProject Open Access oversees a set of over 250 articles on the English Wikipedia, the main article exists in 28 languages, and the full text of several Open Access articles is available from Wikisource. Such reuse in Wikimedia contexts is made possible because a growing number of journals make their materials available under a Creative Commons Attribution License (CC BY), which has no restrictions on modifications, sharing or types of reuse, and is the standard in Open Access publishing, following the Budapest definition of Open Access. There are about 23,000 files from Open Access sources on Wikimedia Commons, about 6,000 of which are used across 300 Wikimedia projects on a total of over 66,000 pages that together garner on the order of a million page views per day. This enriches Wikimedia content and increases the exposure of the underlying research in a way that is simply not possible for publications that are not freely licensed. Despite the growing momentum behind interactions between the Open Access and Wikimedia communities, the prevalence of non-open publications in the scholarly literature remains visible on Wikipedia, e.g. in this list of journals, ordered by number of citations from articles on the English Wikipedia. The first journal in the list that is licensed in a way that allows for reuse of its materials on Wikimedia projects (PLOS ONE) came in at number 22. Wikimedians alone cannot change that, but the wider exposure of Open Access materials through Wikimedia platforms may perhaps serve as an incentive for researchers to reconsider whether putting their articles behind access and reuse barriers is an appropriate approach to publishing them.